33 years ago - Mike Maxwell is born. 17 years ago - 16-year-old Mike begins exploring ancient civilizations of Africa. 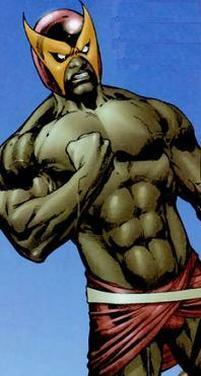 11 years ago - 22-year-old Mike finds the ancient temple of the B'wana and uses their helmet & elixir to become B'wana Beast. 8 years ago - 25-year-old Mike befriends Congorilla. 2 years ago - 31-year-old Mike is killed fighting Prometheus. 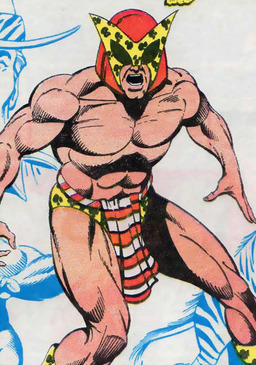 There were a lot of really screwball characters popping up in the Silver Age, and B'wana Beast is as good an example of that as you can get. He's basically a superhero Tarzan, and there's not a lot about that idea that isn't great. We did make a small change to the continuity by removing the legacy character Freedom Beast, the character on the right. This just isn't a prolific enough concept to merit a legacy. 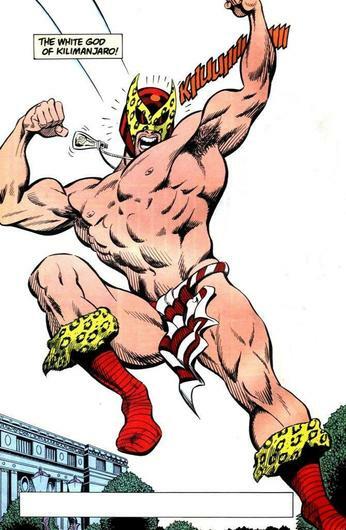 It is worth pointing out that this is a character that really makes less sense as a white guy, although I don't know how cool it would be to have a black superhero running around in a loincloth.